There were a lot of figures planned for the Pursuit of Cobra line that never actually made it out. Sure, if you didn't mind commiting a felony you could get them, but that doesn't mean they were released. Anyway, one of those figures has now been resurrected for the Figure Subscription Service. Desert Scorpions are a harsh and unforgiving as the hot, arid conditions in which they operate. They lie in wait until the sun and sand have taken the fight out of their enemies, then strike with ruthless efficiency and deadly skill. Their desert climate operations gear is designed to preserve fluids, maintain body temperature, and assist in tracking, even in blinding sandstorms. As conflicts in the Middle East continue to escalate, Cobra has benefited from an influx of indigent warriors already trained to fight and survive in desert conditions. They know how to maximize their resources and work together to overcome their enemies, with a zeal most soldiers do not posses. Cobra then adds the frightening technology of huge, heavy armed robotic scorpions, which patrol their encampments at night using infrared scanners to seek the body heat of anything foolish enough to risk a night assault. Now that's interesting. The original figure's filecard told us that being a Desert Scorpion was actually a punishment: Vipers who screwed up were demoted to Scorpions; after a year, they could be promoted again, but if they messed up again, they were sent down to the ranks of the Toxo-Vipers (aka "the leaky suit brigade"). So this new version, suggesting Cobra is recruiting from Hamas and Al Qaeda, is a twist, but it's a modern, logical one. The Desert Scorpion is made entirely from reused pieces - nothing new for him, no sir! But the assortment of pieces chosen does an excellent job of updating the old toy. Resolute Snake-Eyes' mask looks almost exactly like the vintage figure's, especially once the Night-Creeper's head-scarf thing is glued on top. 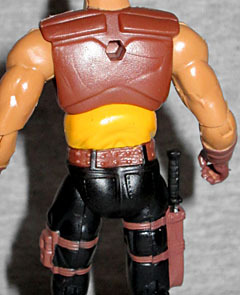 Zartan's torso does a fine job of standing in for his armor. 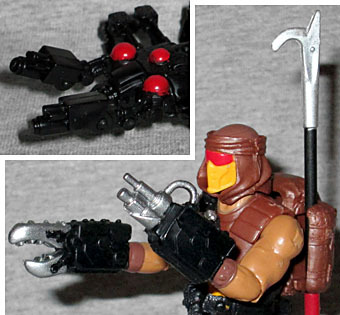 He has Snake-Eyes' upper legs for the straps and the HISS Driver's shins for the padded armor. And finally, to make him bulky, Croc Master's arms. Unfortunately, the torso is so wide that it pushes the arms out to the sides - and they're so bulky, the overall effect is a lot like a Generation 2 figure. Plus, the HISS Driver shins don't have enough ankle clearance, so he's permanently leaning backwards - you really need the included stand to keep him upright. 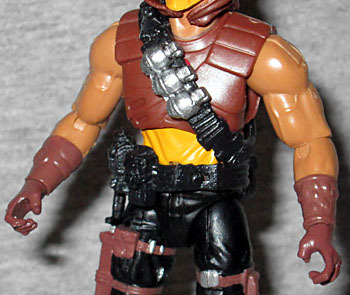 His webgear (from 2008's "Snake-Eyes vs. Red Ninja Troopers" set) rides a little high on the figure, obscuring most of his yellow shirt, and the strap effectively blocks his backpack hole. The armor on his shins should really be brown, not black; it would help break up the monotony. What is nice, though, is his darker-than-usual skintone. It can either be interpreted as "guy from the Middle East" or "white guy who's been out in the sun for too long." Nice! The Desert Scorpion's accessories are no more of a G1 reference than his filecard was. The original figure had a stupidly complex backpack - they had to print assembly instructions on the card behind the figure! This one just gets the same backpack and pike as the Rise of Cobra Desert-Viper, a KRISS Vector gun, and a knife on his leg (if you're lucky - mine didn't include one, and I'm currently waiting to see if the Club can provide a replacement). But that's not all! The original Desert Scorpion came with a large... desert... scorpion. A big rubber bug included with the toy, you see. Well, this one still comes with a scorpion, but instead of being an inexplicably sizeable insect, it's a robot! 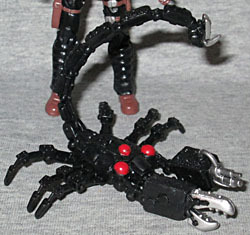 The mold originated with the Valor vs. Venom Sand Scorpion, and is clearly a mechanical item, not organic. It has hinged joints in each of its legs, and a single hinge to make the tail move. The claws can actually be removed, revealing smaller guns underneath. Though there's no indication of it for this release, the claws double as hand weapons (though they really don't stay on very well at all). One is a silver pincher, with the other is some kind of gun or flamethrower. These could almost be seen as an update of the digging tools the original figure wore on his hands. I don't know if it's an effect of the super cold weather we've been having or if the Club has switched to a weaker glue, but we're halfway through FSS 2.0, and so far every figure has arrived with the blister falling off the backing card. That doesn't bother me, because I don't have OCD; it's just an observation. The original Desert Scorpion was released in 1991, and was the final GI Joe figure I bought as a kid - the line continued until 1994, but he was the end of collecting for me. So he was definitely one of the Year 2 figures I was really looking forward to, and the final product does not disappoint. Yes, there are improvements that could be made, but at least all his limbs are the right length, you know?